Dash, Splash and Dance along the music in a spectacular icy experience and rain showers at Asia’s biggest water fun run and music festival. Running has never felt this good. After a successful debut in 2016, the SongkRUN 5K Water Run and Music Festival return on 26 March 2017 with a new scenic route along MAEPS Serdang, Selangor designed specifically for everyone to dash and splash. 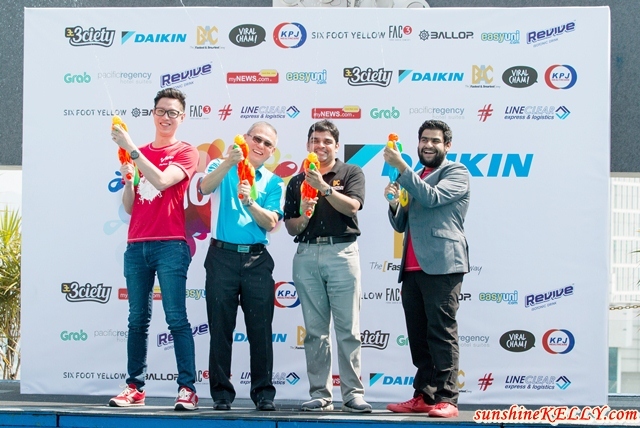 Billed as Asia’s “biggest water fun run and music festival”, SongkRUN assures runners the ultimate feel good factor in the spirit of having fun splashing water to make wet and get wet! Participants will be dashing through a 5 kilometre course that ensures to complete splash from head to toe. This year the “water and music zones” have been re-vamped with various themes each combining a genre of music and fun. Look out for the “water fountain”, the “foam party”, the “rain shower”, the “icy tunnel” and the final station called the “fire brigade”. To join in what promises to be the event of the year, participants can register at www.songkrun.com, where they will get a choice of two race packs. The standard pack includes an official race T-shirt, waterproof pouch, wristband and a medal, while the shooter pack includes additional full-size water gun that can be reloaded at filling stations along the course and in the party zone. RM20 off Early-bird tickets are now available at all MYNEWS outlets in Klang Valley and Kuala Lumpur only.